Special forces soldier-turned-bodyguard Charlotte “Charlie” Fox can never forget the men who put a brutal end to her military career, but a long time ago she vowed she would not go looking for them. Now she doesn’t have a choice. From the searing heat of the Iraqi desert to the snow-capped mountains of Eastern Europe, Zoe Sharp takes readers on a helter-skelter, action-packed ride with this latest instalment in her exciting series featuring Charlie Fox. It's been four years since the last Charlie Fox adventure, but Sharp brings her back with a vengeance, delivering a real corker of a tale for long-time fans and new readers alike. 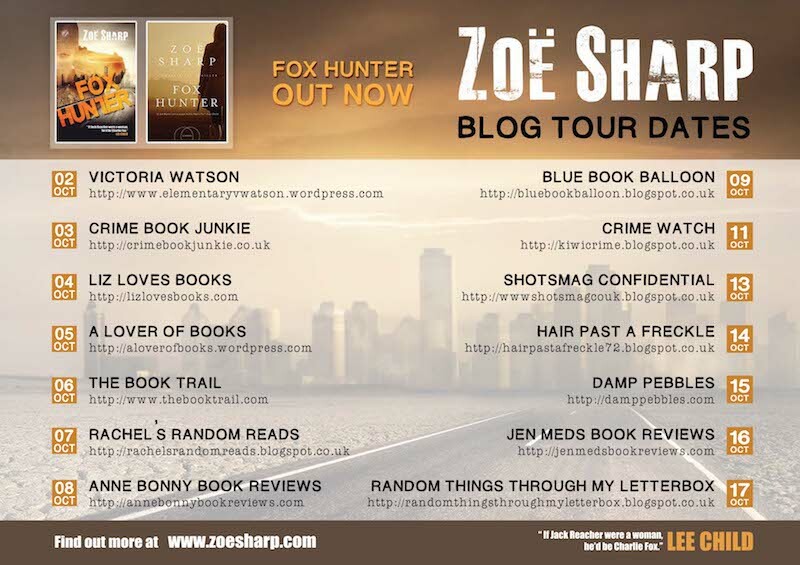 FOX HUNTER is the twelfth book in Sharp's long-running series, which began back in 2001, and manages to be a great standalone read as well as progressing various character arcs from throughout the previous books. 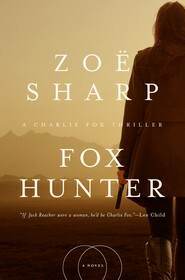 The spectre of Charlie's ignominious exit from the British Army has hung over her journey as a close-protection specialist, and really comes to the forefront in FOX HUNTER as she's forced to confront her ugly and traumatic past. Face to face, in some cases, at last. There's a heck of a lot to like about FOX HUNTER. There's action aplenty, and a great sense of place. I could feel the heat shimmering off the pages when Charlie was roaring around Kuwait and Iraq, trying to track down her mentor and former lover Sean Meyer, while dealing with betrayals, ambushes, and various groups scrabbling to gain any advantage in the ongoing war zone. Charlie Fox is a terrific character; strong, capable, principled, with an ugly past that damaged her before she healed herself. She's often been compared to Jack Reacher by reviewers, and Lee Child himself has even said 'if Jack Reacher was a woman, he'd be Charlie Fox'. I'd certainly recommend the series, and this book, to fans of Reacher who are looking for 'similar but different' books to enjoy, but I do think it's doing Charlie Fox a little bit of a disservice to just think of her as a female spin on Reacher. She is her own woman, a unique and intriguing character on many levels. Just how healed Charlie Fox may or may not be is put to the acid test in FOX HUNTER, as she's forced to confront the events of the past, and the men who were in control of those events. And her. There's a great sense of adventure in this book, it's a kind of rollicking chase story that reminds me a little of a James Bond movie or those classic 1960s-1970s British adventure-thrillers, just with a modern feel and spin. Charlie Fox goes careening around Iraq and Kuwait, then further afield, in her hunt for both Sean Meyer, and whatever and whoever Sean may be hunting himself. But does she really know what is going on? Just how much did that head wound change Meyer's personality? Action-packed, adrenalin-filled, but with plenty of depth and thoughtfulness in among the explosions, gun battles, and hand-to-hand combat too. A very good read.